Brewery Bhavana, Raleigh - A Trifecta of Taste, Design and Beer in Downtown Raleigh! 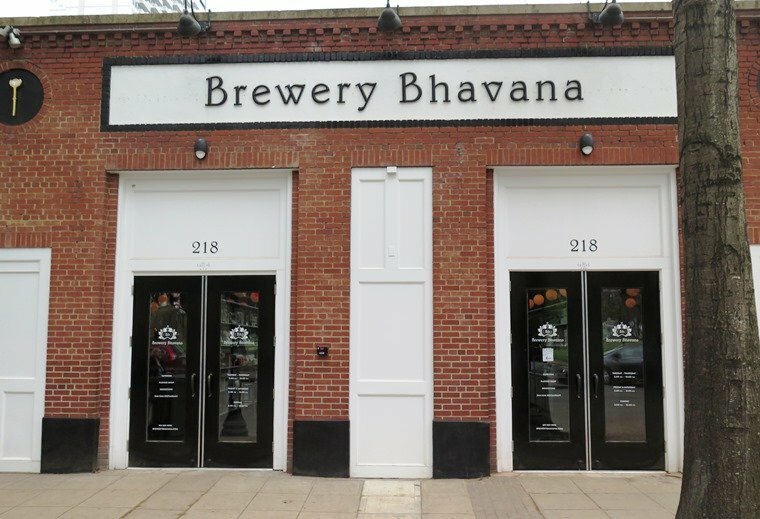 From the outside, Brewery Bhavana looks pretty unassuming but that’s no different that the previous tenant here. Right beyond those double doors is the hostess kiosk with a couple of pleasant ladies there ready to direct you into the new space. Brewery Bhavana is divided into thirds: to the left the beer bar, center third holds the floral area and library and to the right, the dining area. We put in for a table and then head over to bar to grab a brewski. The beer bar is the first surprise, decked out in a lot of whites and creams. No gaudy beer taps, it’s all very sleek and minimalist here at Brewery Bhavana. They’ve got a list of their house offerings on a small sign on the left-hand side of the bar. I try a light IPA which is well brewed and hopped. We’re off to a good start! 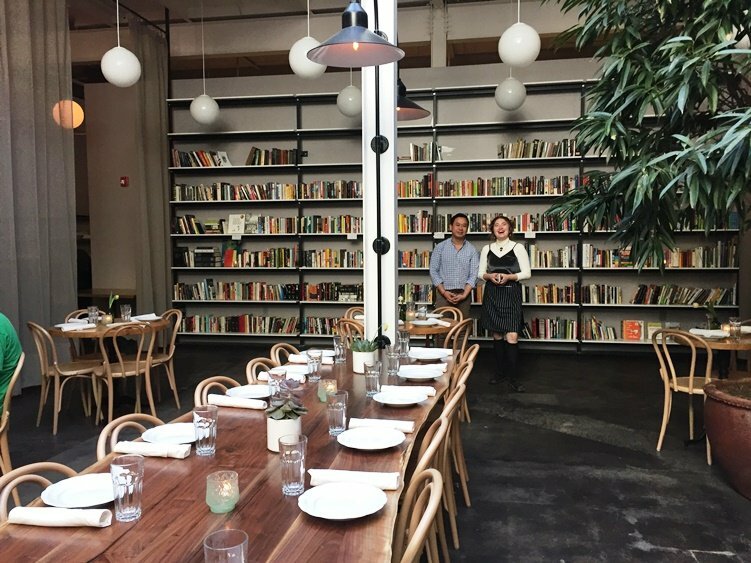 We’ve got a 45 minute wait tonight so we wander over to the florist-library area which also includes some tables for dining and one long communal table. The library is for browsing only and this area is a bit more green and lush to reflect the floral side of the business. Overall it’s hard to believe that this space is the same space that once held Tir Na Nog, a classic Irish pub. After wandering around a bit, we get the text message for our table and head over to the main dining room. In the main dining room the feel doesn’t change much from the first two rooms. 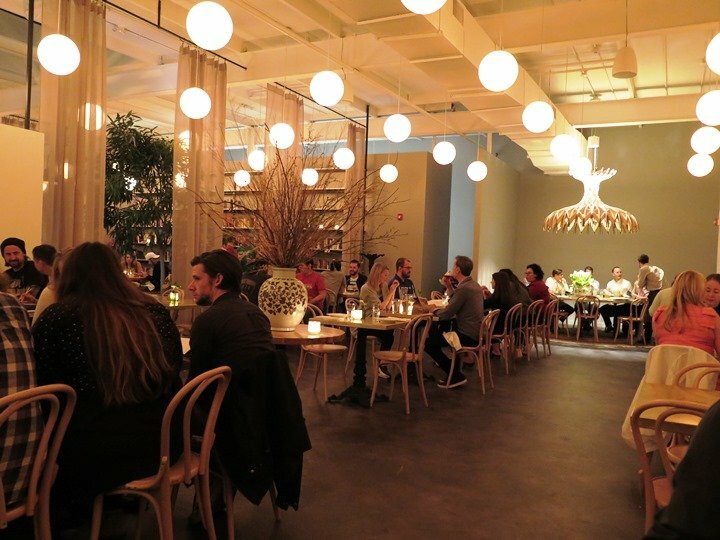 White globe lighting overhead, rattan chairs, there’s a cool wood geometric chandelier over a large group table in back but otherwise it’s business as usual. 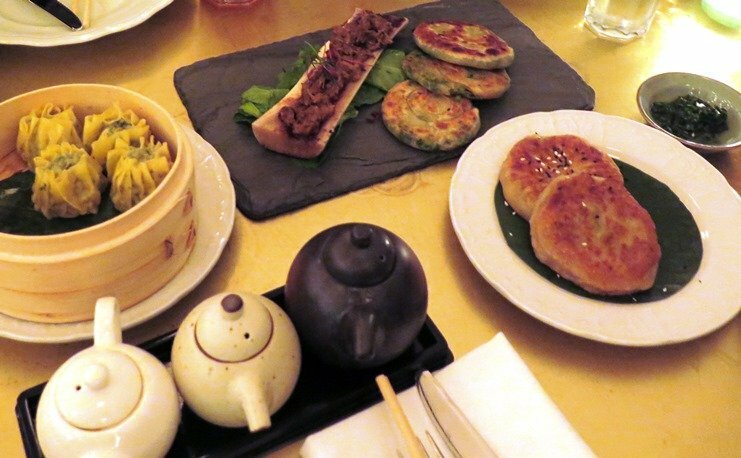 We’re handed over the menu, a quick scan shows off a variety of dim-sum plates and Chinese favorites. Prices are in the $7 to $11 range for small plates with one notable exception, the Peking Duck at $45! Given the excitement and long wait for Brewery Bhavana, we ordered up 4 small plates and of course the signature dish. Even though it’s only day 2 for Brewery Bhavana, the place is bustling, they’ve got a full menu and seem well-staffed so kudos to the team here for making sure the place is ready. We start off with the steamed dishes, xiao long bao (soup dumplings) and shu mai. The soup dumplings are decent but unfortunately, not really juicy. When done well, they burst in your mouth with broth, oh well. And the shumai is fine with four in the plate, perfect for sharing. 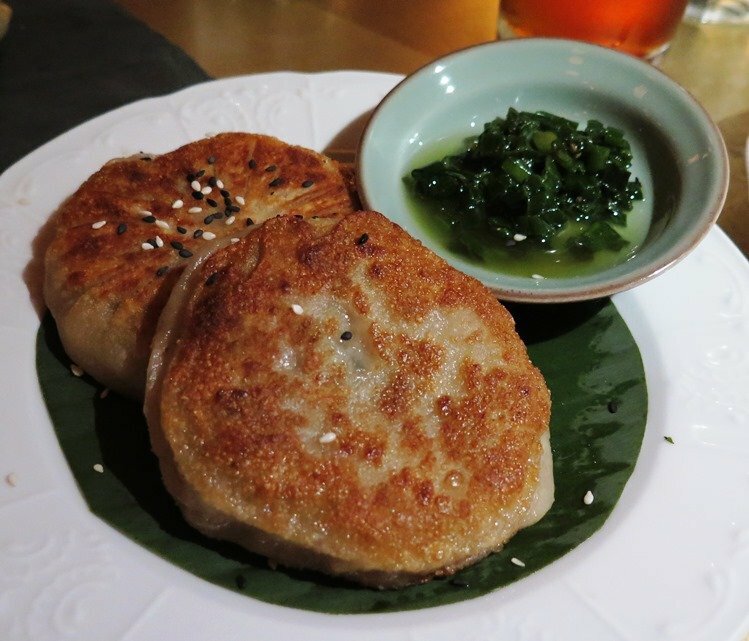 Next up is the scallion pancakes and xian bing (meat pie). 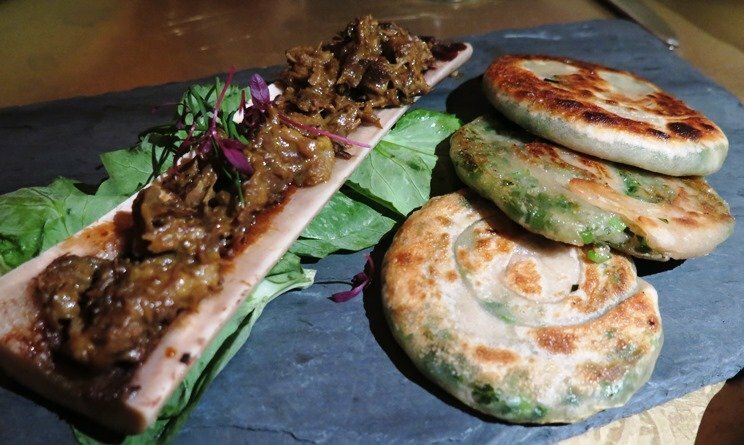 The pancakes are served with marrow which is a bit untraditional but tasty. The pancakes themselves are denser, thicker than what you’d typically get but still display the characteristic swirl to the surface. And the meat pies are nicely browned and fried with a tasty pork filling, a good option for the meal. But let’s face it, we’re all just really waiting for the Peking duck! It comes out on a large platter served up with 7 or so steamed buns, scallions and hoisin sauce. 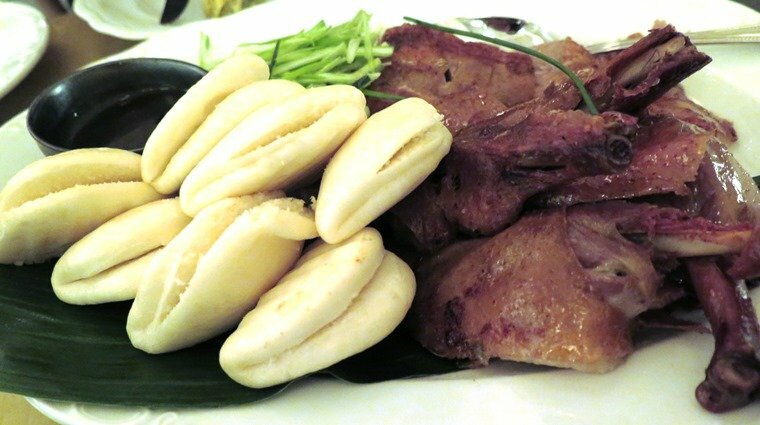 The skin is served separately from the meat and the duck drums are served up whole. 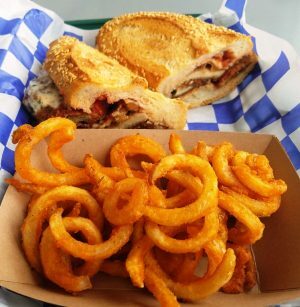 You typically stuff the bun with some crispy skin and meat, add a dab of pungent hoisin sauce and then top with the scallion to make a flavorful and fatty sandwich! The duck here at Brewery Bhavana is solid and certainly worth the money and time, especially if you’ve never tried Peking duck. 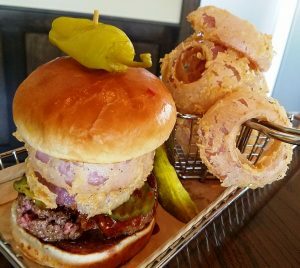 It’s hard for a place like Brewery Bhavana to meet up with the heightened expectations that the Triangle had for its opening but I felt it certainly did. While the concept of beer bar, florist and dim-sum restaurant is tough to wrap your brain around, they’ve done a nice job overall! 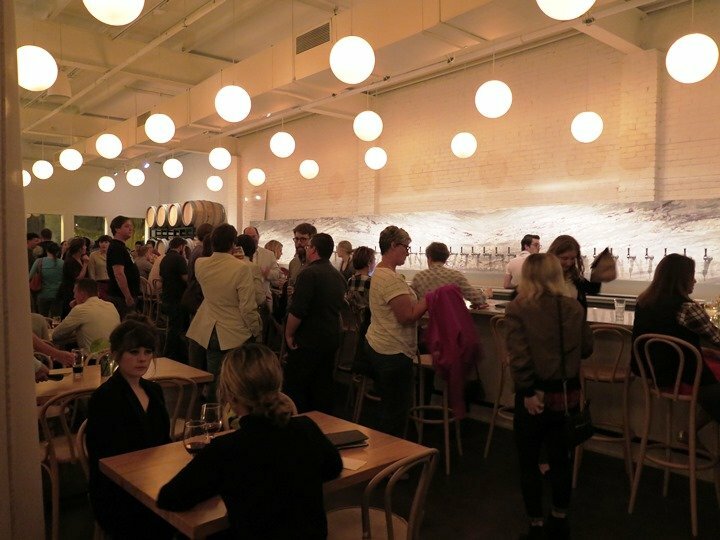 My interpretation of the restaurant and space is that Brewery Bhavana will be a comfortable casual spot to drop in for a beer and small plates. And I’m sure the concept will evolve as they continue to find their groove. So thanks for the great Peking duck, Brewery Bhavana! While it may not have been the best dim-sum I’ve ever had, it’s great to even have that option here in downtown Raleigh.